One of my first side hustles after I started working full-time was as a “healthy volunteer” i.e. guinea pig for clinical studies. My full-time job was as a research fellow at the National Institutes of Health, and right on the same campus were tons of opportunities to make money on the side by letting scientists poke and prod at my body and brain. The pay rate was great, too – $40 an hour at a minimum because there were no undergraduates around to fill the need as there are at universities! With such an unconventional side hustle, you can be sure I learned some unconventional lessons. The activities I participated in for the clinical studies were either fun or boring, but they didn’t require any skills and they certainly weren’t resume-building. I did a lot of psychological studies since they were non-invasive (more on that next), which meant one of two things: sitting in front of a computer or lying in an MRI machine. In front of a computer I would click buttons to make associations or take memory tests. Most of those were fun, if somewhat monotonous. I enjoyed trying to figure out the researchers’ hypothesis. In the MRI machine, the majority of my time was spent lying very still with no outside stimuli and the minority spent responding to images by clicking a button. During a couple of the non-interactive parts of the sessions, I was so bored and soothed that I even dozed off! In what other job can you make $40/hour while you sleep? (Maybe a sleep study!) $40/hour was far more than I was making at my primary job, so to me that was crazy money. There was the potential to be paid even more for doing other types of studies. The researchers aren’t screening people based on their resumes or portfolios – they just need warm bodies that either have certain diseases or are healthy volunteers. Anyone could get that pay rate or even higher, and there were rumors that some locals made a full-time income participating in the studies. The fact that easy money exists doesn’t mean it’s best for you, though! While I think participating in these studies does help the general medical/scientific effort, it really doesn’t do anything for the volunteer aside from lining her pockets. There are probably more productive or character-building ways to spend your time. 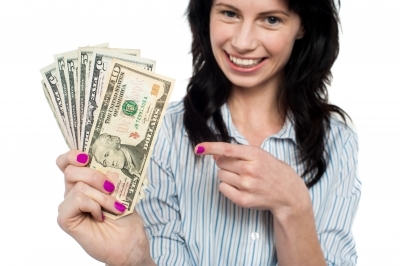 There are some other easy, but time consuming ways to earn extra cash. Services like Opinion Outpost are free to sign up and if you spend enough time completing the surveys the money certainly can accumulate in your account. But remember, just because it’s easy doesn’t mean it’s quick. I was nervous about becoming a guinea pig. Obviously I didn’t want to be exposed to any unsound drugs or cause any lasting damage to my body. I wasn’t desperate for money, just looking to pay for a vacation. I decided to only participate in studies that I deemed “non-invasive” – no drugs, no injections, no interference with my body beyond observation. The studies aren’t meant to put anyone, particularly healthy volunteers, at risk, but I didn’t want to take the time to screen the invasive ones when there were so many non-invasive opportunities. But I’m glad I decided on those boundaries before I perused the higher-paying opportunities that involved taking experimental drugs or whatnot. It might have been much more difficult to come to the same decision with a dollar figure in my head. I also had to keep boundaries with my real-work time. Because the studies all happened on the same campus and during the workday, it might have been tempting to sneak off to participate in a bunch of them instead of doing what I had been hired to do. I scheduled my studies fairly infrequently and for early or late in the day so that I avoided interruptions in my workday. I made sure that I was putting in just as much time as I had been before I started doing the studies. I think we can all imagine the temptation to compromise ourselves if enough cash is waved in our faces. Better to decide in advance what you will and will not do and when you will do it so that you don’t have to make a decision in the moment! One great thing about being a guinea pig is that you get random bits of free medical care. (Not comprehensive! I don’t want to give the impression that this would replace routine care.) I had to have a physical to become registered as a healthy volunteer, and from then on I got little snippets of information about my body’s health status, like my blood pressure. I was even paid an extra $20 before every MRI to take a pregnancy test, simply because I was a woman of childbearing age! The best benefit I received was actually for a genetic literacy trial I did at my current university, not at the NIH. I did this one specifically to get this information and not for the dismal pay rate (darn undergrads!). I had several SNPs evaluated and was given a report on the likelihood that I will develop Type II diabetes based on my genetics. The results were fascinating and truly motivated me to stick with a healthier lifestyle! The best benefit I didn’t receive was a structural scan of my brain. My father suffered a traumatic brain injury a few years before my time at the NIH; he suggested I get a copy of my brain scans from one of my MRIs because it would have been so useful for him to have some “before” images to go along with his post-injury images. Getting the structural images meant I would have some “before” images if something ever went wrong with my brain. Unfortunately I never received mine (I guess the researchers forgot to send them) but when I passed on the tip to other guinea pigs they were able to get theirs. I think that there are hidden benefits to any job we might have and we should take advantage of them as soon as we root them out. Coworkers can be really useful for discovering these benefits. At the very least, there’s networking! I hope you have been inspired by this posts to think about your side hustle opportunities a little differently! What unconventional lessons have you learned from a job? Have you ever participated in a clinical trial? What’s the easiest money you ever made or your best unexpected benefit?